In response to user requests, The Responder Safety Learning Network has added a handout for all online programs. The handout provides a takeaway of all major content points in the program, including interviews conducted with leaders in emergency services and roadway response. The handout for each program is provided in PDF format for easy viewing. 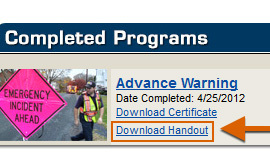 "Our registered users were so pleased with the content of the programs on the network that they asked for a handout as a way to extend the reach of the learning in the modules and continually refresh their memory about the important points in the program," said Steve Austin, project manager for ResponderSafety.Com. "We are pleased to add this feature and feel that it will improve retention of critical roadway safety practices and implementation these practices throughout the country." The handout can be downloaded after the registered user successfully passes the short Skills Challenge test at the end of the program. The download is accessible from the same page as the certificate of completion. The program’s handout remains available indefinitely to any registered user who has passed the associated Skills Challenge test. If you have already passed a program’s Skills Challenge test, you can download the handout right now. Sign into your RSLN account, click the number next to "Completed Programs" in the User Console, then click "Download Handout" for the program whose handout you wish to download.